When I say hog roast what do you think of? Me, I think of pork and apple stuffing in a bap and usually weddings. That is because in the UK when I was a kid that was the only time you saw a hog roast. At a wedding and it was only ever served in baps, usually late at night after the main meal had been eaten. Today, that has changed. The Brits love a Spitting Pig or spit roasted pig and they will enjoy it practically anywhere and, these days, in a long list of different ways. In the UK, street food is huge. Since the recession, the industry has taken off. People on tight budgets still wanted to eat out, and street food seemed to be the answer. They saw more street vendors appearing, so gave them a spin. Most enjoyed the experience and kept coming back. At the time, unemployment was quite high in the UK, so more and more people needed to set up their own businesses. When I say a lot of people, I mean a lot. In just one year, 450,000 people registered as self-employed in the UK. A significant percentage of those people set up their own food companies. Many sold foods they had made in their kitchens at markets and later set up street food businesses. Today, you can buy virtually any food you want from street vendors including spit-roasted meats. Street food is everywhere in the UK. Hog roast vendors are a regular sight at festivals, exhibitions, fetes, markets and sporting events. The meat tastes fantastic and can be garnished and served in a huge variety of ways. I have had it flavoured with Indian spices, served Mexican style in wraps, cold with tahini and pulled with barbecue sauce. It all tasted great. A friend hired a spit roasting machine for his party and cooked one of the best hog roasts I have ever tasted. I was surprised because I did not even know it was possible to hire a hog-roasting machine, and did not realise that you could cook a whole hog without needing any special training. The other great thing about spit-roasted meats is the fact that it can be served in so many different ways. 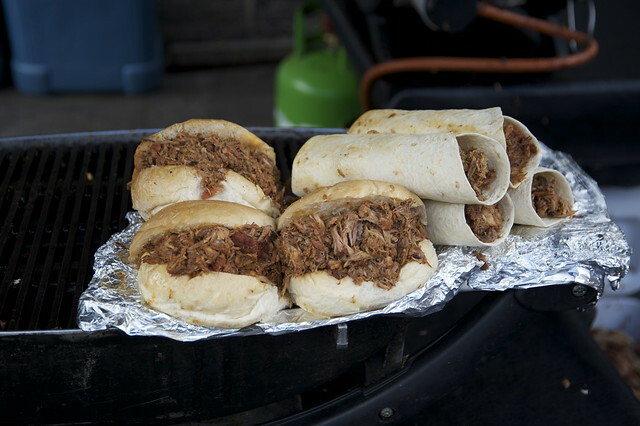 Pulled meat served in baps or wraps is still the most popular way to eat this great food. However, increasingly spit roasted meats are being used as a centrepiece for buffets at events and celebrations. Some firms now set up a spit roaster to cook the meat for their carvery. Many modern spit roasting machines now have space underneath the roaster where trimmings like jacket or roast potatoes can be kept warm. On the side are hot plates, which allow side dishes like vegetables and Yorkshire pudding to be kept warm. There is no doubt that in the UK hog roasts are here to stay.